In 1956 Members of Parliament travelled to Auckland to unveil a plaque, commemorating a century of parliamentary government in New Zealand, on the original site of Parliament. The clip shows Speaker Matthew Oram in his wig; Prime Minister Sidney Holland and his deputy, Keith Holyoake; and the Leader of the Opposition, Walter Nash. The title deeds to the site were handed over to Auckland's Mayor, John Luxford. Reference F27464. 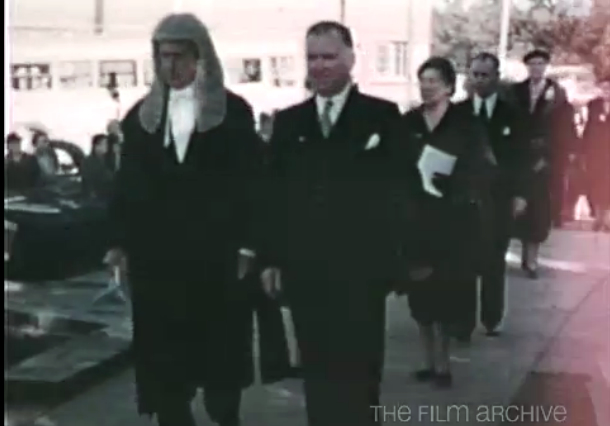 Unveiling of plaque commemorating first Parliament in Auckland, [videorecording], film-maker A.H. Reynolds, 1956.